June 11, 2017, 7:36 a.m. Sadly Bonnaroo has just ended and The Farm is shutdown for the year. However, it's never too early to begin planning for Bonnaroo 2018. Let's go over all the information you need to know for Bonnaroo 2018: when is it, when do tickets go on sale, when does the lineup come out, and more. If you are new to Bonnaroo I really recommend our Bonnaroo Guides & Articles section, which has a ton of great information on Bonnaroo. Also if you want automatic updates emailed to you via our Bonnaroo Newsletter you can register and add Bonnaroo to your events - we promise not to spam and only send you relevant news and lineup rumors for Bonnaroo 2018. Bonnaroo 2018 will be here before you know it, let's make sure you are ready. Oh, and come dance till SUNRISE in Centeroo at @kalliopestage! Code Red! This is not a drill! Bonnaroo has finally announced their 2018 lineup drop. As we have all been waiting and watching other lineup drops the anticipation for Bonnaroo has building and it will finally come to an end on Tuesday, January 9th! Bonnaroo has officially announced the lineup will be out 1/9 and tickets will go on sale (again) at 1/12. Let's see if Bonnaroo has some tricks up their sleeves because right now every Live Nation festival (Gov Ball, Boston Calling, etc) have nearly the same lineup. Don't let us down 'Roo! Bonnaroo has confirmed that Bonnaroo 2018 will take place June 7 - 10. 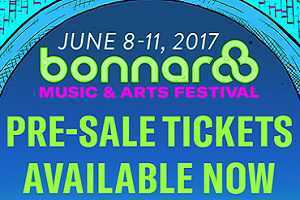 Bonnaroo, as has been the case in recent years, will continue to be a four day music festival experience, running Thursday to Sunday. 2018 Pre-Sale starts Friday 11/24 at 10am ET! Now you've got a chance to WIN 2 GA tickets & a Car Camping Pass before they even go on sale! If you want all of the info on the different pass options available for Bonnaroo 2018 check out our official ticket guide. Nashville - Quite a hike to Bonnaroo, but Bonnaroo now does offer a shuttle service from Nashville to Bonnaroo daily. It's about an hour ride but does let you experience Bonnaroo and Nashville. We have a full article on attending Bonnaroo from Nashville located here. Cookesville - About the same distance to Bonnaroo as Nashville, but far cheaper and less traffic. If you are anti-Camping this is an affordable option that is a straight shot down Hwy. 111/Hwy. 70/Hwy. 55. As I said I highly recommend our Bonnaroo Guide section as I try to write about everything I can think of that will help people plan for Bonnaroo. If you have a question I didn't answer I'd love to hear it so I can add to our coverage. Either let us know on Twitter or feel free to E-Mail Me.